Chocolate Cherry Fondue…the perfect way to end a meal, a warm pot of beer chocolate, served with wonderful cubes of cake, cookies, dried and fresh seasonal fruit to dip into it. The beer choices for this dessert fondue are endless. 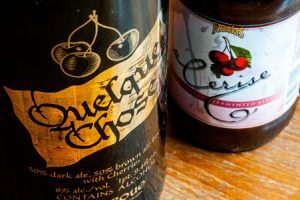 There are so many different types of beers brewed with cherries that can work in this recipe. Who doesn’t love chocolate and cherries in liquid form? 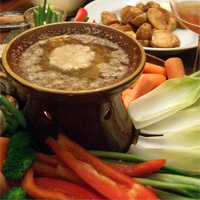 Check out my other Beer Fondue recipes. 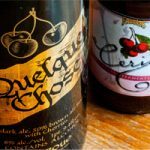 A wonderful rich and decadent Chocolate Cherry Beer flavored dessert fondue, using a complex cherry flavored beer. Bring cream and Unibroue Quelque Chose to a boil in a small sauce pan. Turn off heat, slowly whisk in the chopped chocolate until all the chocolate has melted and mixture is smooth. 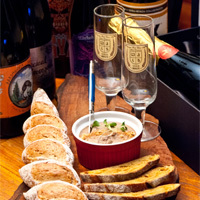 Transfer to a ceramic dish, keeping warm with a candle and serve with Suggested Dipping Sides. A wonderful loaf of sourdough bread is a great accompaniment to any fondue. Try different local or homemade breads to further individualize the meal. Blanching vegetables makes them easier to skewer and sometimes more tasty. Take a large 10 - 12 quart pot of water adding in a 1/4 - 1/2 a cup of salt (water should taste like seawater) and bring to a boil. Cook each prepped vegetable separately for 2 - 3 minutes, then remove from the pot and add to a bowl of ice water to stop the cooking process. Vegetables that benefit from blanching: cauliflower, broccoli, carrots, green beans and asparagus. But I don't have a fondue pot, don’t worry. Try a heavy-bottom pot, double boiler or a ceramic baking dish like a soufflé dish. If the cheese is not melting smoothly, add a few drops of lemon juice or malt vinegar to help break down the cheese protein. Not enough fondue fork | skewers, use bamboo skewers are a substitute. If the fondue is too thick, add more beer, one tablespoon at a time until the desired consistency is reached. Keep the fondue over low heat, if using Sterno Cooking Fuel or portable Butane stove . Too high of a temperature can scorch the fondue. If using flame heat, be prepared in case of a spill and have a fire extinguisher on hand.